The human brain is one of the greatest mysteries in the known universe. We’re here to break down the grey matter to better understand how our brain works. The brain is made up of 75% water. 2. It can also hold 1,000 TB of info. 4. Even with 83k processors & 10.4 trillion synapses, a neural computer needs 40 minutes to process what the brain can in a second. That’s enough to circle our planet FOUR times. 7. There are somewhere between 80 & 100 billion neurons (nerve cells) in the human brain. 8. The left hemisphere of the brain packs in almost 200 million more neurons than the right. 9. Neurons vary in size between 4 and 100 microns wide. Diffusion tractography of the brain, displaying some of the long white matter bundles (red: left-right, green: anterior-posterior, blue: head-foot). Visible are the cortico-spinal tract fanning out in the corona radiata (blue/purple), the long cortico-cortical association bundles (green), and ponto-cerebellar fibers (orange/red). The data was acquired and processed on a GE MRI scanner at 3 Tesla (MR750), using diffusion spectrum imaging accelerated with compressed sensing, a technique developed at GE Global Research. 10. Grey matter is the mass of neuronal cells that are involved in things like memory, speech and muscle control. 11. Despite often being described as grey matter, the brain of a living person has more of a pinkish hue. 12. Grey matter makes up 40% of brain matter. 13. While, white matter comprises the other 60%. 14. White matter gets its color from myelin, which insulates axons and increases the speed at which electrical impulses travel. 15. Men have less grey matter in their brains than women, but more white matter and cerebrospinal fluid. 16. Greater proportions of grey matter may account for superior performance on language tasks. 17. Grey matter is very important during physical activity because it allows you to think and move simultaneously. 18. Research suggests that regular exercise may lead to increased grey matter inside the hippocampus. 19. Myelination occurs during the learning process. 20. It allows you to develop skills, like drumming, over time. The more you practice, the more your myelin grows. 21. More than half of the brain, including myelin, is made of fat. 22. Research has shown that when someone in love is placed under an fMRI and shown a picture of his or her loved one, deep areas of the brain light up. 23. One of the deep center areas of the brain thought to contain the secrets as to why we feel love is known as, the nucleus accumbens. 24. The nucleus accumbens is the place where pathways of dopamine, serotonin, oxytocin & vasporessin — the neurotransmitters thought to be involved in love — converge. 25. Weighing in at 3 lbs., the brain makes up between 2–3% of the body’s mass, but consumes 20% of its oxygen and 15–20% of its glucose. 26. At 2.71 lbs, Albert Einstein’s brain was a bit smaller than average. “We only use 10% of our brain.” is a myth. We use much closer to 100% of our brain. 28. The sleeping brain could power a 25-watt light bulb. 29. The brain actually lacks pain receptors. 30. The wrinkles in our brain, called gyri, increase surface area, allowing us to pack in more memory-storing, thought-producing neurons. 31. When your brain doesn’t get enough sleep, you’re increasingly subject to lost memories, anger, impaired wit, hallucinations, loss of focus, risky decisions, slurred speech, cerebral shrinkage and even brain damage. 32. Sleep deprivation also raises brain temperature. if it gets too hot. 34. During sleep, waste inside the brain is moved into the spinal fluid and distributed to other parts of the body. 35. The brain region that controls vomiting, area postrema, is the only area immune to the blood-brain barrier. This allows your brain to detect noxious substances in your blood. 36. The blood-brain barrier protects against injury and disease by blocking particles from entering the brain, but it also makes it difficult to detect neurological disorders. 37. In the early years of life, 700–1,000 new connections form between neurons every second. 38. In fact, based on brain imaging studies, neuroscientists say your brain isn’t fully mature until around the age of 25. 39. Your amygdala is the part of your brain that processes emotions & is also responsible for the brain’s fight or flight response. 40. Your hippocampus is the part of your brain that processes memories and regulates emotions. 41. The frontal lobe handles a lot of decision making functions. 42. The parietal and temporal lobes process new sensory information. 43. The cerebellum coordinates movement. 44. 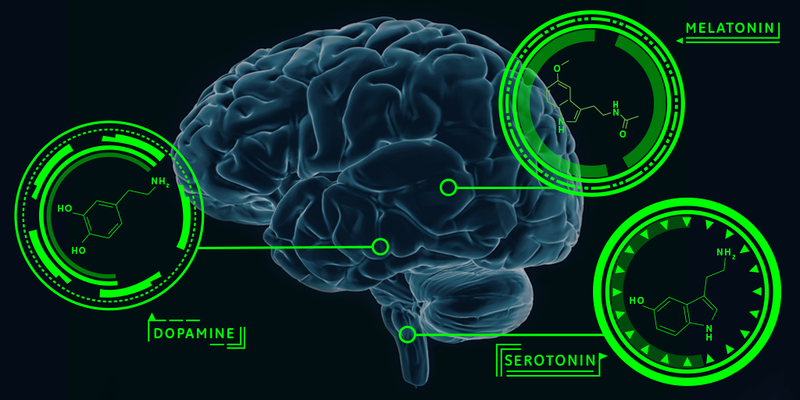 Dopamine, serotonin & melatonin perform a wide variety of functions, yet are all made of the same elements (hydrogen, oxygen & nitrogen). 45. Extroversion, curiosity & optimism are driven by regions to the right side of your brain. 46. The brain’s prefrontal cortex is impressively resilient, in part because there is a lot of redundancy in it. 47. The brain stem is very delicate. Even moderate damage can be fatal. 49. Although, removing parts of the brain can have consequences, like rare cases of hyper-empathy after brain surgery, that neuroscientists didn’t expect. 50. We’re as much as 50 years behind understanding how the brain works compared to every other organ. That’s why GE is working to better map the connections inside of your mind. GE is the world’s Digital Industrial Company; transforming industry with the GE Store’s shared tech & software solutions, allowing machines to connect & learn.